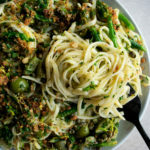 This my friends, is a pasta for the books: green olive linguine with broccolini & lemon breadcrumbs. It’s tangy, briny, smooth and herbaceous, and takes under 30 minutes to make. So in other words, pasta night heaven! I just recently found a love for olives. They had always been on my very short list of ingredients I don’t enjoy (cilantro is definitely on there, too). Something possessed me to give them another try the other day, and somehow I am now hooked. So naturally I had to make a recipe using the little nuggets right away. 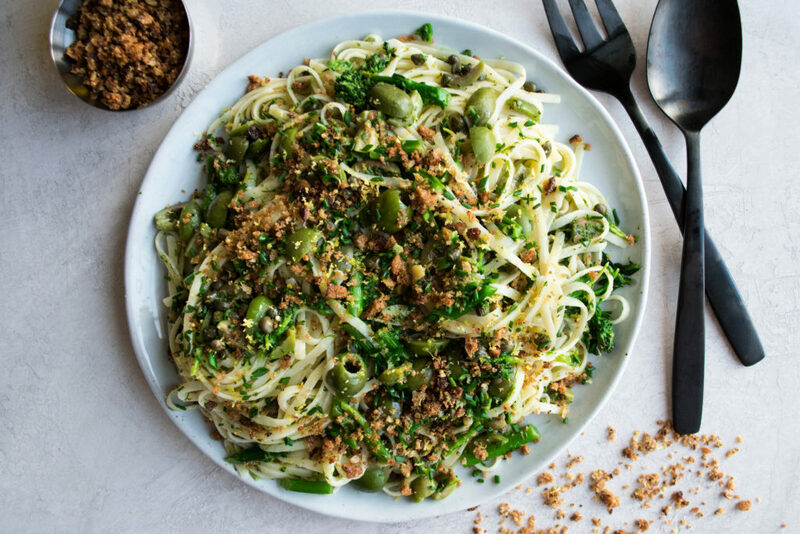 And so, this green olive linguine was born! This pasta is irresistibly good, and honestly quite simple. Broccolini blanched until bright and tender. Linguine cooked until al dente. A quick olive-oil based sauce made of garlic, green onions, pasta water, butter, and lemon juice. Olives, capers, and the broccolini folded in. 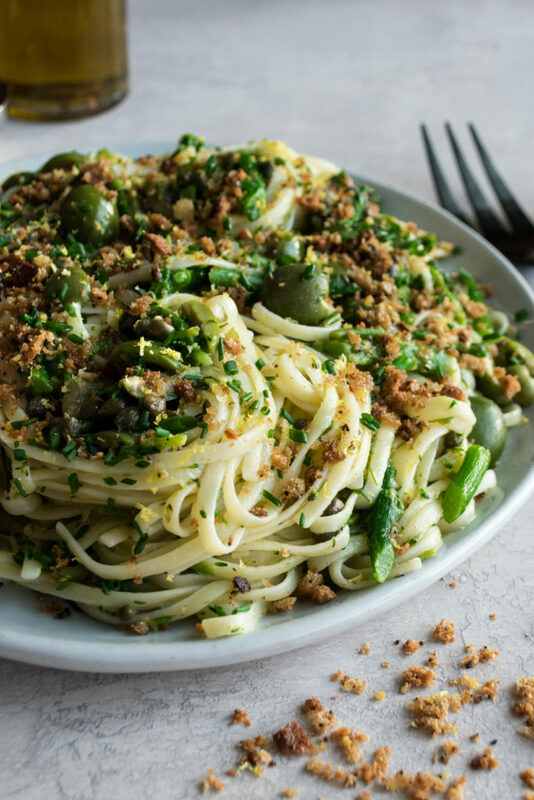 Lemon-infused breadcrumbs and chives on top. Let’s just say I couldn’t stop eating this for lunch, and if you like all things salty, silky, and lemony…you will love this. Bring a large pot of salted water to a boil. Add the broccolini and blanch for 3 minutes, or until bright and tender. Transfer the broccolini out of the pot (reserve the water) and into a large bowl of ice water. Let cool in the water for a minute or two. Transfer the broccolini to a sheet pan lined with paper towels and let dry. Once dry, roughly chop the broccolini. Meanwhile, make the breadcrumbs by placing the bread into a food processor. Pulse until crumbs form. Heat a large sauté pan over medium heat and add enough neutral oil to fully cover the bottom and come up the sides about ¼ of an inch. Once the oil is hot, add the breadcrumbs. Toast until golden brown. Quickly use a strainer to retrieve the breadcrumbs and transfer them to a plate lined with paper towels. Immediately season with the lemon zest and a pinch of salt. Let cool. Bring the water in the pot back to a boil, add another pinch of salt, and drop in the linguine. Cook for 1 minute less than the package’s instructions, stirring often. Heat a separate large, heavy-bottom pot over medium heat. Add the olive oil. Once the oil is hot, add the green onions. Let sauté for a minute or two. Stir in the garlic. Add 1 cup of pasta water from the linguine pot. Let this come to a bubble and cook for a minute or two. Drain the linguine and immediately add it to the sauce. Add the butter and gently stir the linguine until the butter melts. Stir in the lemon juice next. 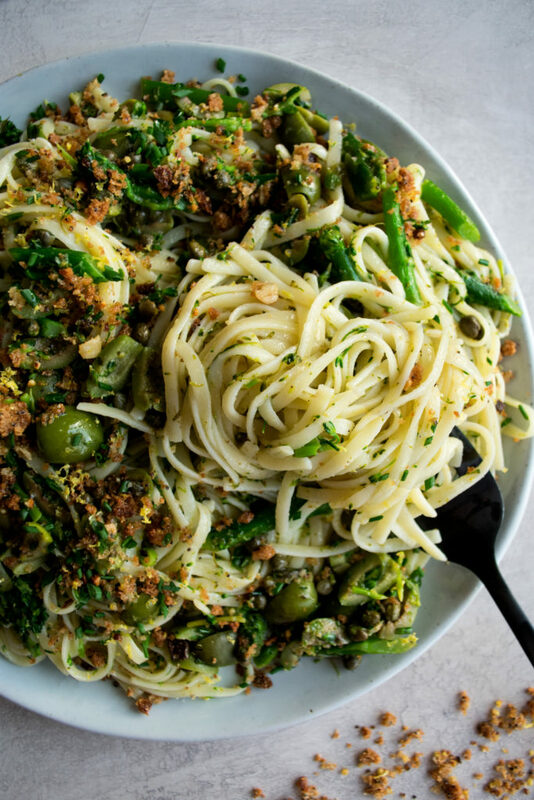 Fold in the chopped broccolini, green olives, and capers. Let warm through. 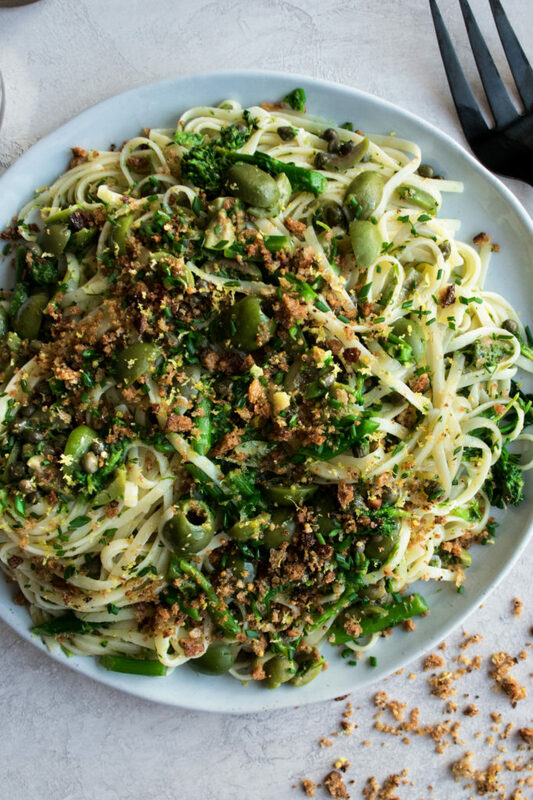 Serve the linguine with the breadcrumbs and fresh chives on top. Squeeze a bit more lemon juice and add a drizzle of olive oil to finish.